These Mini Corn Dog Muffins are sure to be a hit at dinner time. My kids LOVE corn dogs. So do I, if we’re being honest here. What I don’t love is all of the weird ingredients in the store-bought frozen variety. I also don’t especially love making them the traditional way at home. It is messy, time consuming, and deep frying? Come on. I need to quit that. Here is my alternative, mini corn dog muffins, and I must say, it satisfied my corn dog craving without taking too large of a bite out of my daily calorie allowance. Certainly a LOT less than its deep fried cousin would have. As a bonus, my kids DEVOURED these. My super picky, would eat mac-n-cheese every day if I let him guy had seconds and thirds. You can’t beat that! 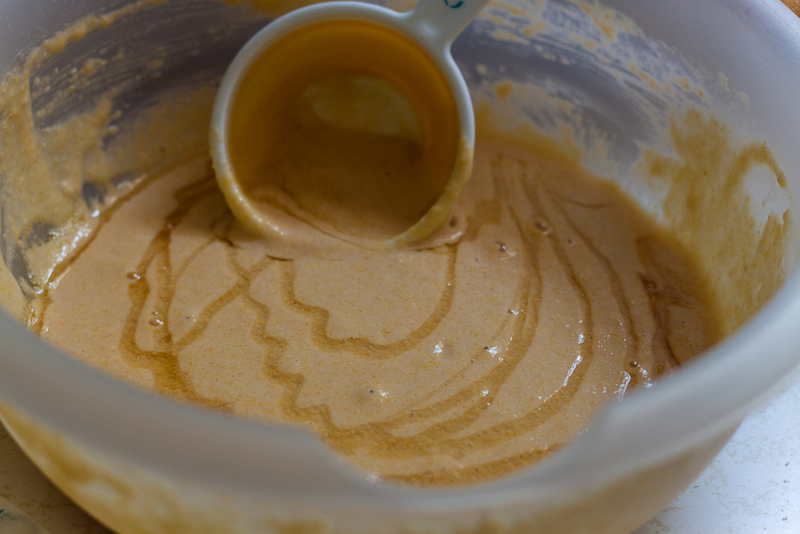 Start by mixing the cornmeal, flour, sugar, baking powder, salt, milk, and egg in a mixing bowl with a whisk. Mix well. Then drizzle the honey over the top. Not mixing it in all the way leaves you with little honey bits in the batter which I LOVE. Cut up hot dogs into the desired size. I personally like a bigger hot dog to muffin ratio, and like the bigger chunks of hot dog in mine. You can cut them up small if you have little ones (choking hazard! EEEK! ), or leave them big. If you cut them up small I suggest using several pieces in each muffin, especially if you make them in large muffin tins. I also want to add that these little mini muffin ones would be a perfect appetizer! Fun, cute, and bite sized. You see the ones on the right side of the photo? Those are the larger pieces of hot dog I was mentioning. Much better than the thin slices that are hidden in the batter on the left. Bake these at 400 degrees for about 25 minutes. Your oven may vary. Mine is a little wonky and has some hot spots, so check carefully. They are done when they start to turn golden brown on the top. And serious, the mini ones are so cute! Put all ingredients, except the hot dogs, into a bowl. Mix well with a whisk until well combined. Drizzle in honey on top of batter. Cut up hot dogs to your desired size. Place in greased muffin tins. Scoop out batter with a measuring cup and pour batter over hot dogs and bake at 400 for 20-25 minutes, or until the tops are starting to turn golden brown. Serve warm with ketchup and mustard. Reheats well! 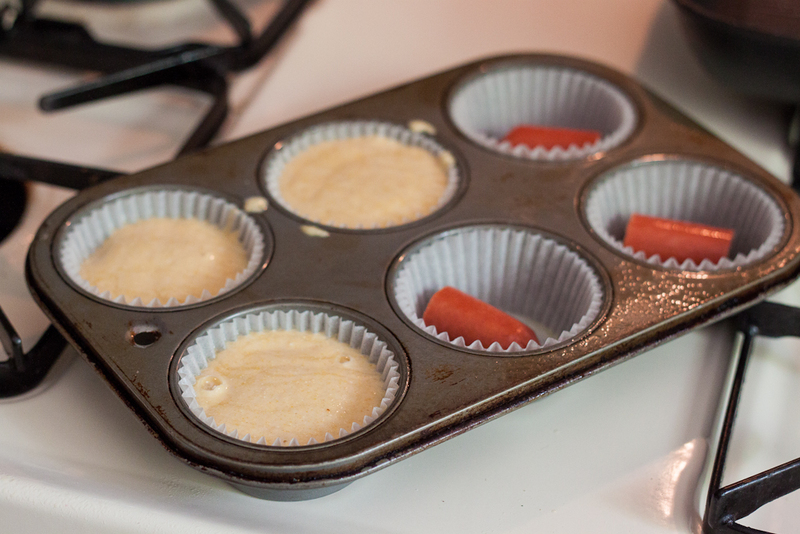 Hope you like these Mini Corn Dog Muffins as much as we did! I know exactly my kids will adore this! Thank you so much for the recipe..
I’m such a corn dog lover and these corn dog muffins are right up my alley! I need to make these for my Super Bowl party. They’ll be the hit of the party. Those look so good! My family is going to lose it when I serve these up. And I WILL be serving these up. Om nom nom. I’m pretty sure everyone in the house would LOVE these. 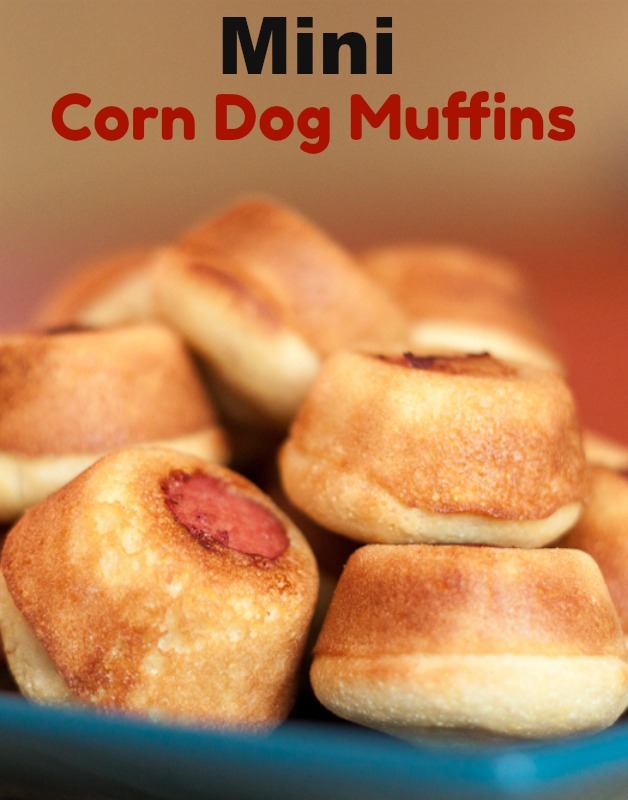 We enjoy regular corn dogs, so these muffins would be a hit! This would be a cute game day appetizer. I always have the toughest time making corn dogs and getting the batter to stick and this recipe would give us that corn dog flavor we love. Thanks. So trying this one. That is a great idea for making them, I’ve never seen anyone else do them this way. They’d be perfect for parties and gatherings as an appetizer. What an absolutely delicious sounding snack are these! I can just imagine having some of these at a party or as part of a lunch box. You always have such great ideas for crafts and food. These look so good I am sure your family and kids must love those muffins. I have one grandson who would love these everyday for lunch. Fun way to serve hot dogs. Awww these are super cute! I’m vegetarian so I won’t be trying these out but I have no doubt that these would be a hit at any party. Are you kidding me my kiddo we need these in one foul swoop! I think I need to make these for the Super Bowl. OMGoodness, someone send me these, how awesome would this be as a snack at a party or game night. These look really good. I love a good corndog, and my grandkids will love them. I cannot believe I haven’t seen this one sooner. This is awesome for snacking! This is such a great idea. I love corndogs. These are cute and quick. I need to ask my kids if they like corn dogs. I know they like hot dogs, this is terrible that I don’t know. Homemade is the best way to go for sure. My daughter loves corn dogs, but they are a pain to make. I love your simple version. These are such a great idea! My son would love these. I’m sure you could freeze these and pull them out for lunches or a quick meal! Yum! These mini corn dog muffins would be great for our movie night on Friday. We have movies lined up already but I haven’t decided on what to make for a snack while watching. Now I have found the perfect snack to serve my family. How awesome is that making your own corndog. I should try this since my daughter love corndog. These look so good! I still need to make them for my kids as a quick weeknight meal option. These will be perfect for game day. Homemade is so much better than store-bought. YUM! These look really good. I need to add this to my list of things to make when we have the boys. Wow! Cute recipe! I love this idea and I think it would be perfect for entertaining! Baking is definitely a more healthy way of cooking. One can do without all the fat that frying would have entailed. This way it is both tasty and healthy. My kids would LOVE these as an after school treat! I have everything, I should try them today! These are so cute & look so yummy! Definitely making these for my toddlers! These sound so good. I am sure that my family would love to give them a try. The kids love anything that can be finger food. Oh yummy. I am going to have to give these a try like ASAP! Can’t wait to see the looks on my kids faces when they see these on the table. I like this idea of mini corn dog muffins. They’re perfect for family BBQs and are a fun snack for the kids to enjoy.